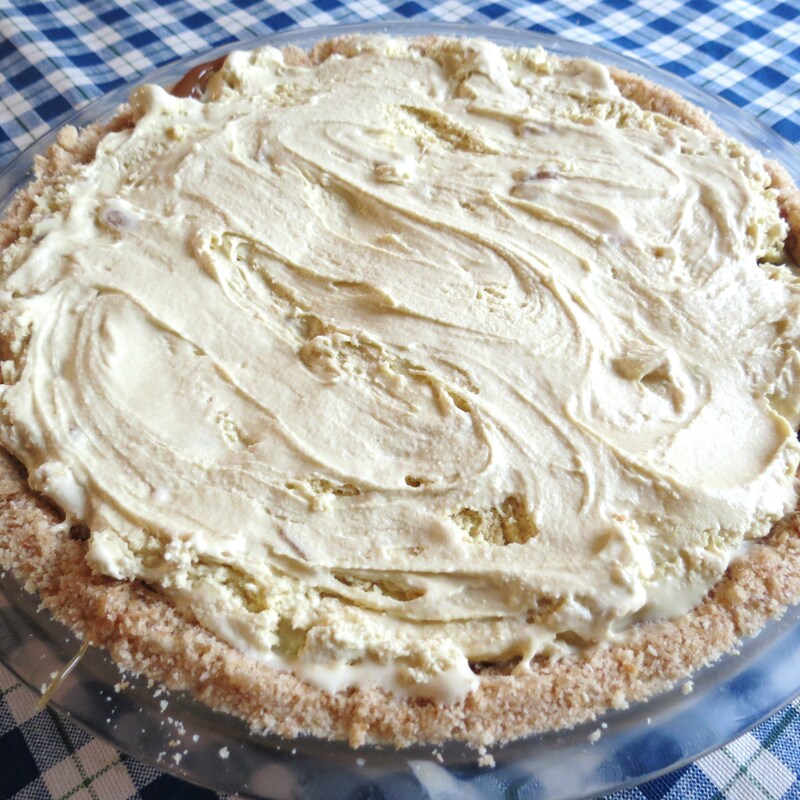 I could’ve titled this post ‘The Pie that Didn’t Make It’…. or “The Terrible, No-Good, Very Bad Pie Day”… but you get the idea. Like many of you, I’m constantly saving recipes on Pinterest, so I decided to find a super yummy dessert recipe. 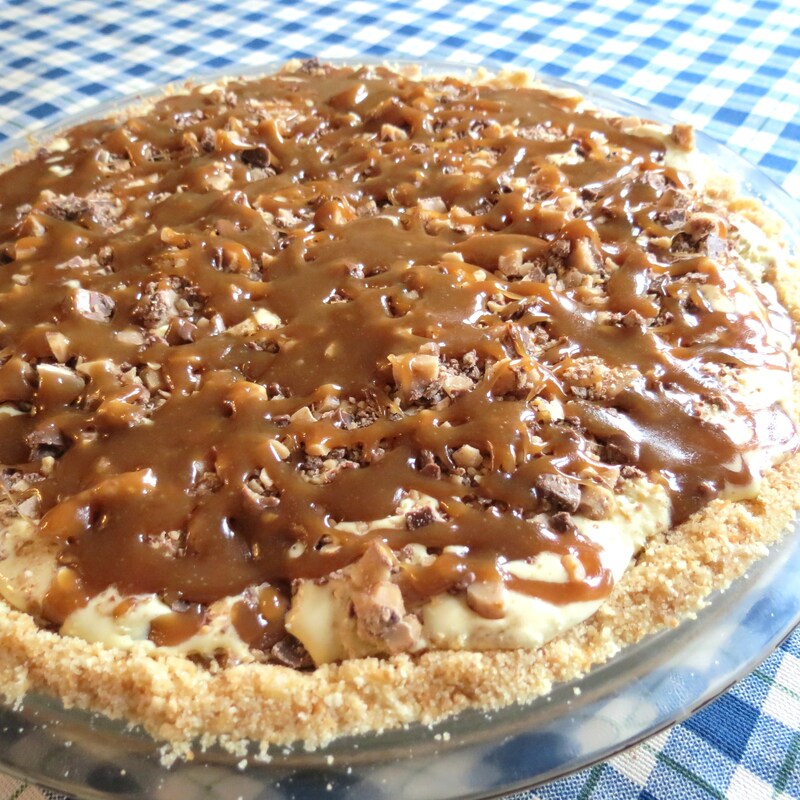 And I did, namely Toffee Ice Cream Pie, which features a ‘Nilla Wafer’ crust, ice cream (I used Butter Pecan simply because I love it), crushed toffee candy bars and a delicious homemade caramel sauce. The cookie crumb and butter crust came together easily. Then I prepared the caramel sauce while the cookie crumb pie crust cooled for a bit in the freezer. Once the sauce has cooled a bit, a good amount of that fabulous caramel sauce is poured over the crust, then slightly-softened ice cream is added. My overly-softened ice cream began to melt as I was taking a few photos, so I hurriedly sprinkled on the crushed toffee candy and put the pie into the freezer for a few minutes before I drizzled on the rest of the caramel sauce. Now here comes the bad/sad part – I wiped out the top of the pie as I put it in the freezer. Half of all that buttery caramel, toffee candy, ice creamy goodness was left dripping from the bottom of my ice cube maker, where it immediately began to freeze. I tried repairing the damage and photographing the pie while at the party but, although absolutely delicious, it looked like a disaster. And now I come to the part of my day where I did a serious, no-holds-barred face-plant into my hosts’ front door – which resulted in me sleeping in pain that night and going to the emergency room the next morning. As I trotted up my friends’ front steps, my boot failed to clear the top. I stumbled forward a few feet, hit the front door with my face and fell backwards like a turtle. I ended up with an instant bump on my head, which is still there. Of course, both my hands were injured in my futile attempt to save myself. Luckily nothing was broken (as it turned out, I had broken a bone in my left hand…) but my right hand is now in a removable splint and looks like a small, fat balloon. ++ I should never be put in anything removable ‘cause I end up doing a lot of removing. I’m so sorry about your bad day…thankfully you weren’t hurt any worse than you were. Don’t overdo your wrist. I know your pie was delicious even if it didn’t look as good as it might have and that your friends enjoyed it. Thanks so much for your kind wishes !! I’m doing a lot more ‘resting’ than I’d like and I’m not getting much accomplished but, as always ‘This To Will Pass”! The ‘like’ is for the recipe but I certainly am not liking the luck you’re having. Feel better soon & be careful out there! I’m sorry to hear about your various disasters especially the ouchies. Get well soon. The pie looks delicious anyway. Thanks for your well-wishes. And I agree – the pie does look pretty darn good, even though the caramel sauce wasn’t yet poured over the pie ! !